Halo Kitty's battlefield pragmatism shows through in her army-green Meowjolnir Mark IV armor, but her favorite color is actually pink--that's why her weapon of choice is the Needler with its razor-sharp crystalline pink ammunition. So yeah, I'm far from an expert on Halo, but we play Halo 2 (Slayer or Team Slayer) at the day job sometimes (a lot). This week one of my co-workers brought in Halo 3 which we played a few rounds of. The controls are amazingly smooth, to the point that I felt like my mediocre playing ability was embiggened by the controls. In reference to my in-game squirrely-ness and how difficult it was to kill me, my co-worker said, "you're like a monkey from hell." That's probably just true about me in general. hey, i LETTERED that story. it's all just words on paper until i finish it off with...words...on paper. 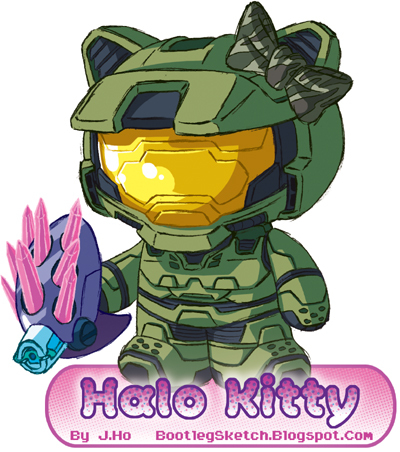 I would have a blast blasting Halo Kitty... and probably gettin' pwned by her. Badtz Maru in a Brute Chopper will save me! jenn: hahaha... i wish these were up for adoption/mercenary services.